The essense [sic] of simplicity - modern and clean. Uniquely encased to celebrate Banana Republic's thirty years of style. The new version, developed by perfumer Laurent LeGuernec, is meant to have "more texture and depth". The notes are reportedly the same, only the proportions have been tweaked. The key notes of this luscious fragrance include: Jasmine, Jasmine and more Jasmine! Also with Sweet Honeysuckle, Sparkling Lemon Essence, Luscious Orange Blossom, "Beach Found" Ambergris, Blond Tobacco & Sultry Sandalwood. Oh, and did I mention Jasmine. Other recent launches from Opus Oils: Unearthly Beauty? by Gretchen Bonaduce. I haven't found anyone who has tried Opus Oils yet; I'm really curious! Their website is intriguing and fun. 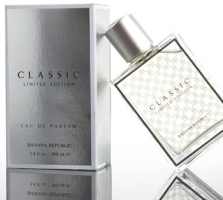 Banana republic classic perfume? Sounds like something just perfect for my aunt who has all of the other scents from them. I actually thought their rosewood was a nice one too. Not something You'd expect from Banana republic clothing company. I have tried a few and they're sweeter than I like personally. Have you tried a board search at MUA? I'm a little confused by the Opus Oils ad for Jitterbug. Didn't jitterbug take off in the '30s? Yet, they paired the name with a photo of a flapper. I imagine they think no one will notice. Good catch. If you go to the website, they're actually listing a whole bunch of “inspirations” for the new boutiques & the scent. I'm pretty sure it was BR Classic I once loved and owned a small bottle of (could have been “M”, but I don't think so). Seems a bit weird to have a commemorative LE if it was only launched in 1995, but I guess these days 13 years qualifies as an oldie but goodie? In any case, I'll be curious to sniff to see if I still like the notes. My favourite Banana Repblic scent is Black Walnut – what a wonderful, long-lasting, rich and luxurious fragrance that is. The packaging is superb too – a wooden box which has a top magnetised the the bottom half revealing the bottle snuggly fitting within. The big bonus is that the fragrance takes ages to dry down, projecting a mildly boozy feel to it, (and yes you can smell a kind of black walnut accord in the opening). What's very clever is that at the very end of the drydown it smells like how Riverside Drive starts out! I love it – and will certainly be revisiting Slate and will try this Classic Ltd Edition too. I just ordered sample packs of a bunch of their stuff (their aesthetic is so ME! lol) so I can be a guinea pig! I will report on Jitterbug. The scents do sound like they will be sweet, but I like a well-done sweet now and again. They really did do a great job packaging that collection, agree! Wish it were easier to get “real” samples. I got a mega sample pack of the Opus collections yesterday and just put on the Jitterbug. It has a surprisingly green opening (reminded me a little of EL Private Collection for a second), then gets very floral (definitely jasmine). I have had it on about 10 minutes and it is soft without being too powdery, but still has a slightly sharp undercurrent that keeps it from being cloying. I do not do a big application when I first try something although id did double-dip this one, and if I doused myself with this I would probably pass out. I can tell that this brand is probably best as an oil that you dab on. I understand your feeling about the Opus being sweet. To me just opening the package was evocative of the happy hours spent in my youth at the hippie-oil shop, so sweet probably isn't the word I would use, exactly. There is something really nostalgic about that smell that people searching for a more modern take or have unpleasant associations with that incense, musk, rose oil ad patchouli aura would be put off by. Not that these smell like that, exactly – the combo of all the perfumes together in the bag gave me that feeling. I'm looking forward to exploring this line – I like the packaging and aesthetic, the prices are decent, and the customer service is very nice. Tama, would the Jitterbug knock you out because the jasmine is so strong, or is it the sharp undercurrent you mentioned? I do love jasmine. I said that because I feel like it could be overwhelming if you really dosed yourself, like a lot of fragrance oils. I may have been hasty about the sprays – I will have to go to Hollywood on my next So. Cal. trip to test for sure! It isn't any one thing and if you like jasmine, the samples are only $2 – worth a shot. I love jasmine and am anxious to wear this again. However, I got samples of everything in their line so Jitterbug may have to wait a couple weeks for another go. I have found that sometimes my first try on a scent is completely different than the second. Okay, I had to dab a little on since I am still unshowered and can wash it off. It's pretty nice – I can notice the honeysuckle and orange blossom more this time along with the jasmine. The lemon is subtle. I don't find it sweet but it is definitely Floral with a capital F.
Yesterday I wore their Voodoo from the Fetish collection – it was dark, mysterious and a little funky (in a good way) and lasted all day. Thanks for the detailed descriptions! I do love jasmine, and so it sounds like I should try it. I did report those new scents at Luckyscent in a shopping post. Sorry – I stand corrected! I was probably looking for it after you posted it. If you decide to try some of the Opus, stay away from the Burlesque collection – the ones I have tried all smell like candy, albeit interesting candy. If you don't like sweet go for Fetish. Middle ground seems to be the Divine. This one smells a bit like eau de Cartier.